Well according to the June edition of Good Food magazine, that offers readers a host of delightful and mouth-watering summer dishes, puddings and delights to welcome in the long sunny days. The heavenly combination of a Strawberry cheese cake sponge jumps out of the magazine's cover and 'puts summer on your plate'. Its recipe takes 25 minutes to prepare and 60 minutes to cook, but it hits my taste buds and there is no need for extra cream as the cheesecake mixture bakes with the sponge, studding the cake with creamy pockets of deliciousness. I just can't wait, but hang-on a moment, my strawberry plants are yet to produce fruit. I'll just have to wait until July. That is the story for most of the great seasonal recipes on offer in this edition. It is still a month ahead of growing time with recipes using seasonal fruit and vegetables such as French beans, aubergines, gooseberries and cherries. I'd love to have my home-grown tomatoes for the Slow-roast tomato tatin and my red peppers for the Spanish stuffed peppers. They are both inspiring summer dishes, which is more than can be said for the look of Good Food's Beefy melanzane parmigiana - it looks a mess and I blogged my own more appetising version on 20 December 2013. 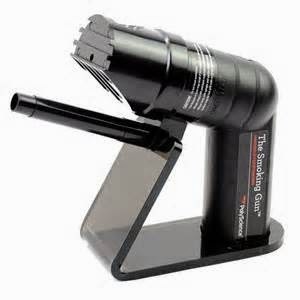 It's Father's Day on 15 June (don't forget) and Good Food suggests some possible foodie gifts for the 'old man'. I hope I don't get the 'Mr Stag and Mr Badger dinner plates or the 'Mr Tea Towel', but the 'Dough whisk' looks useful, as does the expensive 'Hand-held smoker' (£60), for adding flavour to butter, sauces, dressings or cocktails (below). Talking of cocktails, the magazines World Cup feature focuses on the hosts Brazil and in addition to a Latin-American barbeque with dishes to delight family and friends, they include a Caipirinhas with pineapple, a traditional Brazilian cocktail made from the cachaca liqueur. It looks thirst quenching! 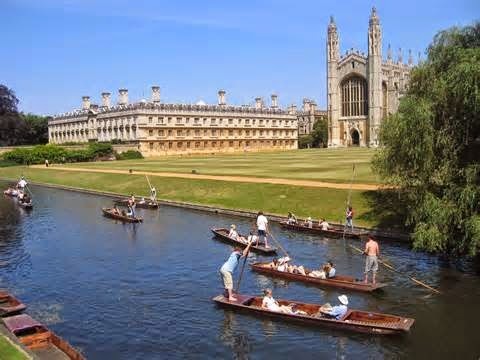 With Cambridge holding its 'Eat Cambridge Festival; from 10-24 May, the university city is this month's recommended 'Food lovers' weekend'. Clare Hargreaves enjoys a delightful break and provides inspiring places to eat and food delicacies that undergraduates have at their figure tips, like Fitzbillies famous Chelsea buns. 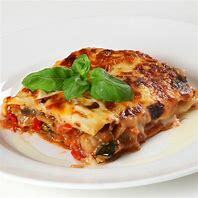 Both the Cambridge Cheese Company and the Cambridge Chilli Sauce Company get rave-reviews from her and top-notch Sicilian pizzas oozing cheese, can be found with other Italian goodies at 'Aromi'. It all sounds as if it's worth a trip. Hurray, at last a 'My Kitchen' that features a male! 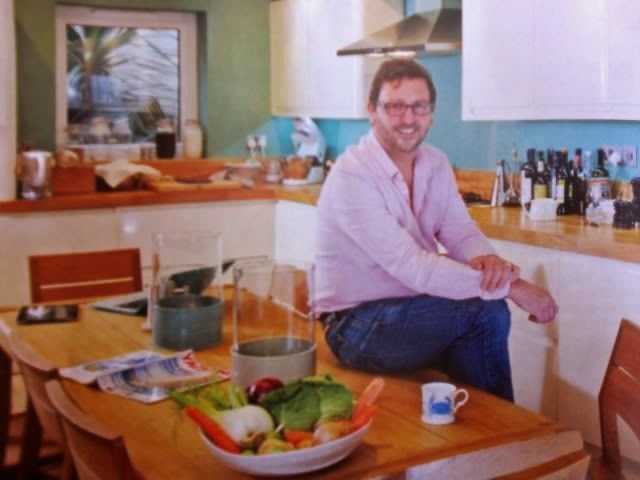 Mitch Tonks (below), a former accountant and now chef and restaurateur, shows readers around his sanctuary and explains the design behind the kitchen and his style of cooking. He also spends a weekend in Brixham, recommending his favourite spots for food lovers. The early morning fish market gets a good plug as does the idea of buying fresh seafood directly off the boat. Tips on where to eat and hotels to try, make up a great read. I was dreading little Maisie making teriyaki salmon in this Good Food, but it's not so much the difficulty of the recipe or her lack of enthusiasm for making Japanese-inspired fish parcels, it's the terrible photographs of Maisie in action. As I've said before, she is not the cutest of girls, but surely photographer David Munns could ask her to hide those terrible teeth when she smiles. Sadly, the picture of the finished dish was equally as disappointing - a tiny photo overpowered by Maisie's grand action shot. Please try harder David. 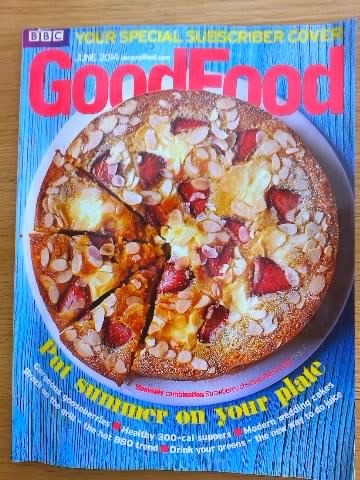 Overall it is an inspiring edition of Good Food for June, with plenty of exciting summer dishes and picnic food to try, interesting articles on preserving, a cookery school from James Martin in making croissants, vegetable drinks and some great wedding cakes.